In the last five weeks Doctor Who series 11 has given us some very good episodes (give or take a misstep or two), and has consistently developed a strong core dynamic with loads of highly promising potential in the new TARDIS team lead by Jodie Whittaker. Now, with episode six, the season – and the Whittaker/Chris Chibnall era as a whole – has its first truly brilliant story. All of the pieces have been coming together over the last month: Whittaker has long since come into her own as a great Doctor, her TARDIS team is developing into a trio of very strong characters with genuine emotional arcs, and the stories have given us a thoroughly enjoyable blend of classic, vintage-feeling Who and a very 2018 variety of socially-conscious, humanistic sci-fi. But as usually happens after a soft reboot on Doctor Who, the season has been playing around with tone and style, finding its voice across different sorts of episodes; sometimes successfully (the tense and claustrophobic The Tsuranga Conundrum and the thematically fascinating if somewhat uneven Rosa) and sometimes not so much (the hamfisted and underwritten Arachnids in the UK). But now, at the season's midpoint, the elements have clicked into place, and this newest regeneration of the show asserts its voice very strongly with a genuinely great hour of television. 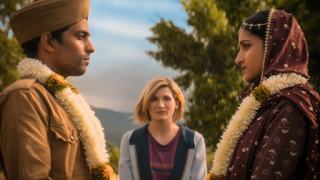 Ironically, the season's best episode yet is the only one so far to not be written by new showrunner Chibnall; it is instead written by playwright turned screenwriter Vinay Patel. It is Patel's first script for Doctor Who, but it is also an obviously very personal historical drama that feels like a passion project rather than just a typical script for a weekly serial. After Rosa it is this season's second historical story, and it finds The Doctor and company in India on the day of Partition: the hasty and quickly disastrous separation of the country by the British into India and Pakistan, which lead to massive displacement, riots, religiously and ethnically-motivated violence, and ultimately the deaths of about a million people. 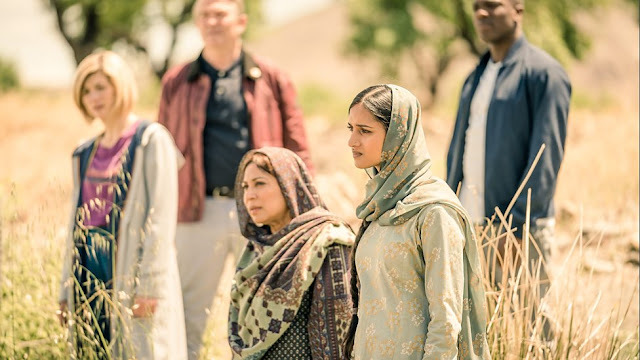 Demons of the Punjab puts Yaz in the spotlight, as The Doctor takes her back in time to learn about the painful past that her grandmother never speaks about. The trip places them in the heart of a country that is dividing not just geographically, but socially, as religious/racial intolerance and hatred stoked by divisive politics tears communities and even families apart. 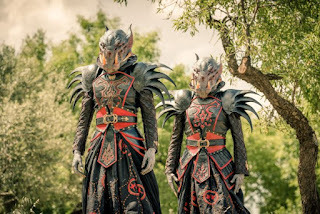 There are also aliens, of course, lurking in the background with shadowy motives, but this is ultimately a very human story: the demons of the Punjab are our inner demons, and our tendencies to turn against each other. The aliens serve to give the story a definite Doctor Who twist, but the tale of a divided family in a divided time is so strongly told that it could stand on its own without all that. It is obvious that the script is written by someone who cares deeply about telling this history, and for whom this history is part of their own heritage, and it makes the events feel vividly real and powerfully tragic. Using time travel to tell this story allows Vinay Patel to explore the events from two perspectives: that of the characters for whom this is the present, and who thus have hope that things will turn out well, and that of the characters for whom this is the past, who know that events are going to end very badly. This lends a certain amount of dark fatalism to the story which adds to the punch-in-the-gut feeling that it has at times, though it counterbalances that with Doctor Who's typical humanism and hopefulness, even in the face of such a grim human-rights atrocity. One also can't help but see warnings about our modern world in the episode, as there are very clear parallels between how India became ideologically divided and how our society is similarly divided now. Extreme, divisive rhetoric stoking fires of nationalism, racial supremacy, and Islamophobia... these themes are all frighteningly familiar, as is the grim statement by the one of the episode's protagonists, that the violence is being cause by “ordinary people who have lived here all their lives, whipped into a frenzy to be part of a mob... there's nothing worse than when normal people lose their minds.” This episode is not only a powerful history lesson, but an equally powerful reminder that we are still susceptible to those same tactics, and that violent tragedies and societal self-destructions like this are things that we are still all too capable of if we don't learn from the past. Demons of the Punjab is not only by far the best episode of Doctor Who series 11 so far, but is also the best historical episode in a few seasons (possibly even since Vincent and The Doctor), packing an emotionally resonant punch. It raises the bar on what this already strong season can do, and announces Patel as a very strong new writer for the series, and one who I very much hope will return. He has pushed Whittaker's TARDIS team in a new, dramatic direction, and all involved have risen to the challenge beautifully. If this episode is representative of the Whittaker/Chibnall era at its best, then we have some amazing things to look forward to. 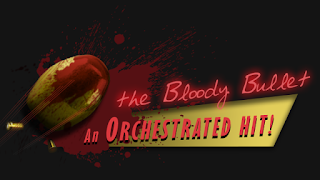 Don't leave us hanging in the time vortex - share this review!